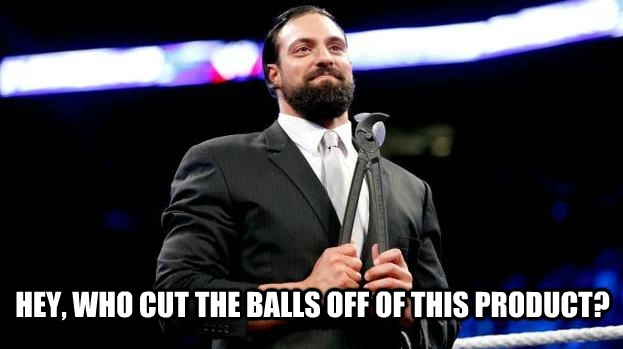 The Meme Event: WWE Smackdown 5/24/13 - WrestleCrap - The Very Worst of Pro Wrestling! 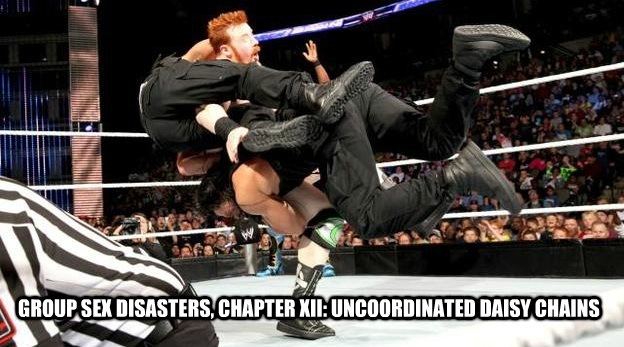 18 Responses to "The Meme Event: WWE Smackdown 5/24/13"
Kudos on the Kaitlyn/Seth Rollins. I actually put my finger to my screen and laughed a good one. Don’t worry I didn’t watch the last RAW, not even surprise RVD return could get me to watch RAW. Maybe it was all a conspiracy to undermine the boycott. And Justin, for what it’s worth, I didn’t watch either, & almost punched a hole into my monitor when I found out the ratings actually went up. 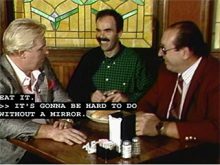 I only watched the last five minutes out of random channel surfing. Safe to say I’m not watching it again next week, or the week after. Probably not the one after that, either. THAT IS NOT FUNNY JUSTIN!!!!! There are times when I think that sites like WrestleZone are controlled by the WWE. What better way to get disillusioned internet fans to watch your show than by making them think an internet darling from the past is returning? you think ratings went up for RVD? 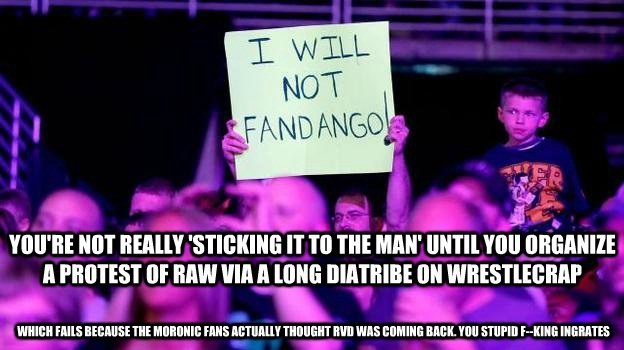 TNA had him for ages and he never did anything for them. 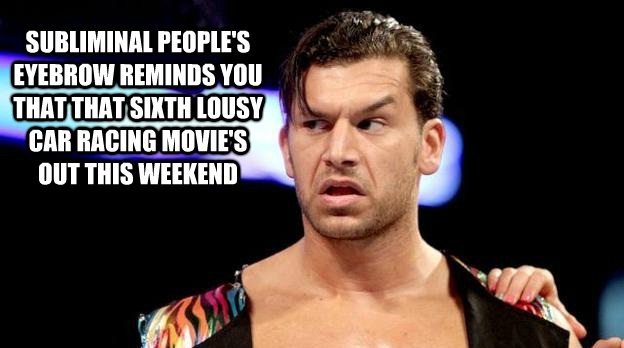 True, but it seems A LOT of fans wouldn’t stoop so low as to actually watch the competition. Mind you, considering how much Impact sucked this week, I can’t say I blame them. Your dead-on with Swagger/Bryan one. 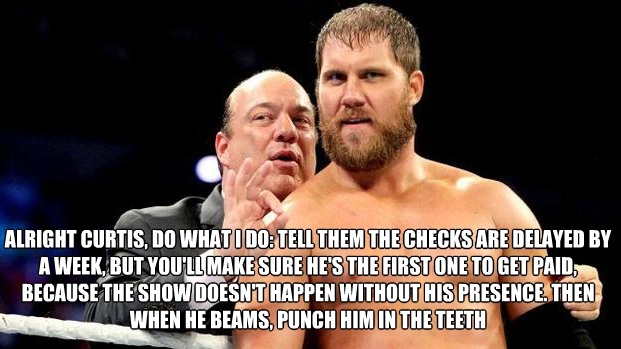 Considering Swagger being in the title picture caused WWE to lose their WHC, they might think again about pushing a guy who fucks up like IMMEDIATELY after his push begins. 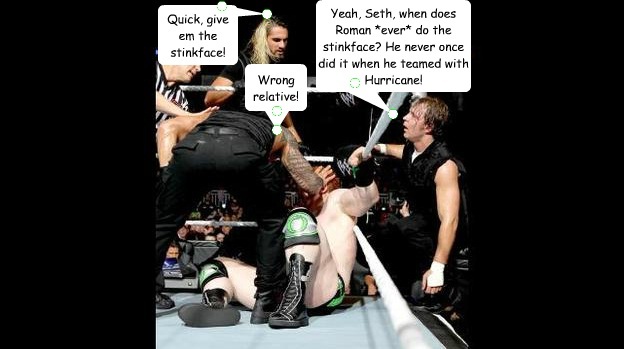 I didn’t even bother with RAW…again, or anything WWE related, for that matter, except for these memes, of course. 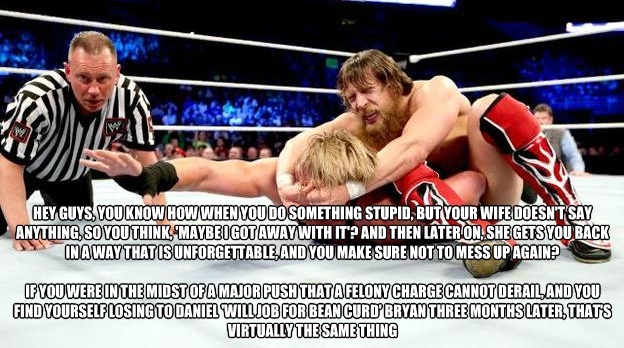 The Miz Million Dollar Dream FTW, but Teddy Long crashing a funeral and the Daisy Chain were damn funny too! Should we just change the meaning of WWE to World Wrestlecrap Entertainment ?? I can’t get over the way Daniel Bryan set up the No Lock at the end of that Swagger match. Just brutal. I hope he doesn’t do it every time, though, because it would lose its impact.